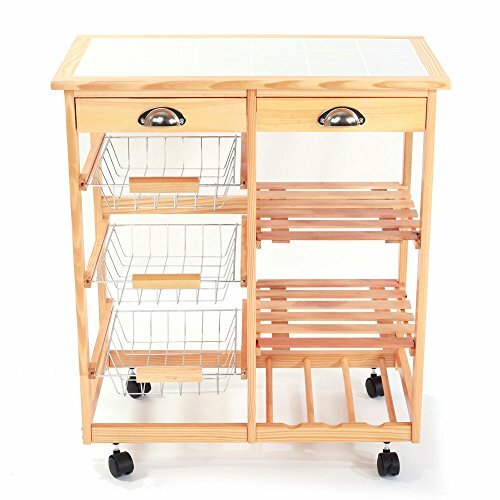 The Kitchen & Dining Room Cart 2-Drawer Removable Storage Rack with Rolling Wheels adds extra counter and storage space to your kitchen or dining room. It has two drawers, two rows and a wine rack for simplified organization and easy accessibility. Plus, it is on four 360-degree spinner wheels for ease of mobility. Stainless steel handles on the drawers resist rust and corrosion for durability while adding styles. Simple modern design will fit into a variety of home decor styles with ease. Don´t hesitate to buy now! View More In Storage Drawer Carts. If you have any questions about this product by Teekland, contact us by completing and submitting the form below. If you are looking for a specif part number, please include it with your message.